Objectives: To explain what the Ummah is and what links the community together. The Ummah is the Muslim community of believers. Its members share the same faith and their commitment to the Shahādah. As soon as someone utters the testimony of faith “lā ilāha illallāh, Muhammadun rasoolulullāh”(meaning: “There is none worthy of worship except Allāh, and Muhammad is the Messenger of Allāh”) they are a part of the Ummah. From that moment on, the whole community is obliged to help him when he is in need and to advise and correct him when he is wrong. The Ummah is obligated only to unite upon that which is good and correct and to reject that which is wrong, immoral and sinful, even if it is from a fellow Muslim. A Muslim should always try to follow the laws, customs and traditions of Islam. A Muslim must never support another Muslim when they do wrong. Most people who become Muslims and members of the Ummah change their names to a more traditional Muslim name. This shows and makes apparent their new Islamic identity and their new relationship with God. Many male names start with “Abdul” meaning “Servant of” followed by one of the names of God Himself. For example: Abdul Ghaffaar: the servant of the All-Forgiving. Abdul-Rahmaan: the servant of the Most Merciful. Abdul-Baseer: the servant of the All-Seeing. Abdullaah: the servant of Allah. The female servant of Allaah is: Amatullaah. Other female names are: Khadeejah, ‘Aa’ishah, Maymoonah, Zainab and so on. All Muslims see themselves as brothers and sisters to all other Muslims. A Muslim’s relationship with God and other pious Muslims is seen as more important than their relationship with impious and sinful family members. Having said that, God forbids that one’s family be abandoned and ignored. Indeed, one’s family is more deserving of da’wah and advice than outsiders. When the Prophet (salallaahu `alaihi wassallam) and his Companions left their families and properties behind in Makkah, they made even stronger bonds of brotherhood with the believers of Madinah. The Ummah has always included people from all nations and races. They all have rights and responsibilities. Everyone has rights in the sight of Allah regardless of skin, colour or race – the only thing that makes one person better than another is his (or her) knowledge, piety, worship and nearness to Allaah through righteous deeds. Women and men are different as Allaah has made them different – and their roles and duties are different – but a pious worshipper from the women is just as beloved to Allaah as a pious worshipper amongst the men. For both there is Paradise as a reward. All Muslims are commanded to practice the Five Pillars, follow the Sharee’ah (Islamic Law) and follow the guidance and Sunnah of the Prophet. Many Muslims live in the Middle East but there are hundreds and millions that live all over the world. In a non-Muslim country like Britain or the US, the Muslim Ummah is one of many communities that make up society as a whole. It not only has its own beliefs, values, customs and traditions but also its own pace of life built around the yearly cycle of its calendar and the daily routine of prayers. It has its own food and dress code and, in some places, its own schools. All these things unite the community and make it stand apart from the rest. 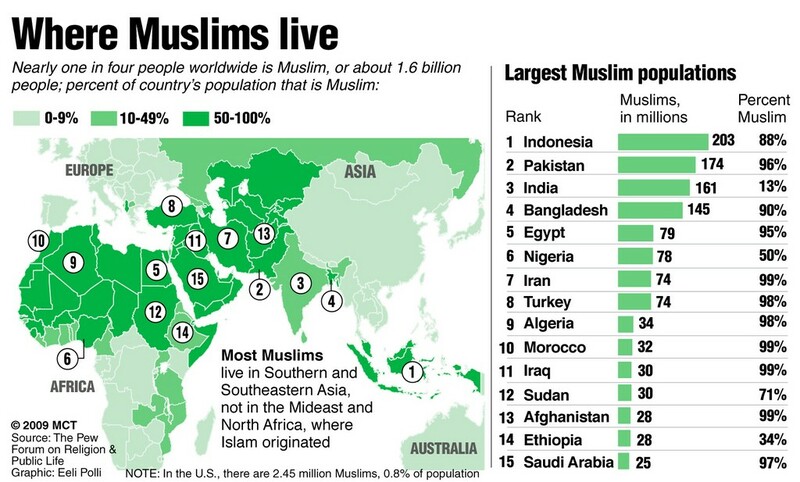 Facts: An estimated 2 million Muslims live in the UK; 204 million in Indonesia; 164 million in Pakistan; 76 million in Turkey; 28 million in Saudi Arabia; 73 million in Nigeria; 74 million in Egypt. Summary: You should know what the Ummah is and what links it together. They are linked by faith, not birth and support each other in only that which is right. How can a person become a member of the Ummah? Who are a Muslim’s ‘brothers and sisters’? Why do many names begin with ‘Abdul’? Give two things that all members of the Ummah have in common. 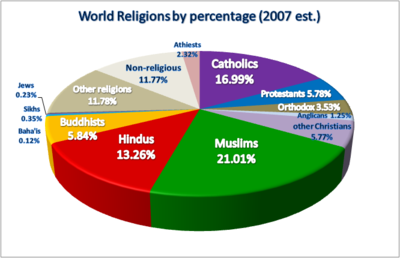 Note: Orthodox Muslims do not consider Iran to be a majority Muslim country since they follow the Shi’ite faith which is actually a “religion” on its own, separate from Islam- and it rejects most of the fundamental tenets of Orthodox-Sunni belief.